NETWORK FINALS: The 8PM DOUBT fell 0.1 in final numbers to a terrible-even-for-Saturday 0.1. In addition, UFC FIGHT NIGHT gained 0.1. CABLE HIGHLIGHTS: A&E’s LIVE PD topped the night, down 0.08 from last Saturday to 0.60. (HBO listed the licensed movie HACKSAW RIDGE as an “original,” as per its usual practice.) Fox Sports 1’s coverage of the CONCACAF GOLD CUP match was at 0.46. Adult Swim changed its late-night block, at least for this week, placing the previously primetime DRAGON BALL SUPER at 11:30PM, where it was at 0.39 (up 0.13 from last week), with DRAGON BALL Z steady at 0.35. The rest of the line-up had ATTACK ON TITAN steady at 0.31, TOKYO GHOUL up 0.02 to 0.28, LUPIN THE 3RD up 0.02 to 0.24, HUNTER X HUNTER up 0.02 to 0.25/500K, NARUTO steady at 0.20/436K, GHOST IN THE SHELL steady at 0.17/367K, and SAMURAI JACK at 0.15/323K. On HGTV, HOUSE HUNTERS RENOVATIONS rose 0.04 to 0.29, and a 2PM RENOVATIONS GAP was also at 0.29. On Spike, COPS climbed a tenth to 0.27. 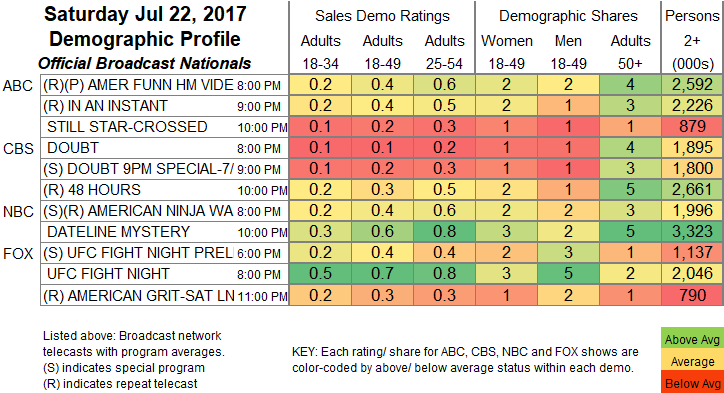 Nickelodeon’s NICKY, RICKY, DICKY & DAWN gained 0.08 to 0.27, SCHOOL OF ROCK was up 0.05 to 0.23, and THE DUDE PERFECT SHOW was at 0.21. NBC Sports Net’s NASCAR race was at 0.27. On Food Network, KITCHEN AT FN rose 0.04 to 0.25, and SUPER SOUTHERN EATS was at 0.20. ESPN’s WORLD SERIES OF POKER coverage was at 0.24. ID’s FATAL VOWS fell a tenth to 0.20. 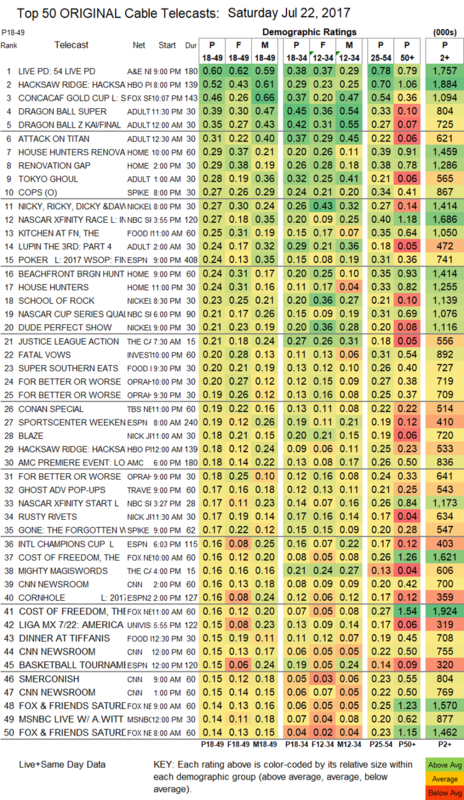 On OWN, the series finale episodes of FOR BETTER OR WORSE were at 0.20/0.19/0.18, compared to last week’s trio of 0.17s. AMC’s TURN ticked up to 0.12. BBCAmerica’s ORPHAN BLACK rose 0.02 to 0.09.